I had hoped to get out for a hike on Monday, but the first good rain we've had in more than six months came through the area during the early morning and I had no interest in a wet outing. I saved the hike for the following day where I was treated to clear blue skies instead. The trails were damp and sometimes muddy but it was a beautiful day with crisp, cool Fall temperatures. My goal was Lookout Point located outside Del Valle Regional Park and the Ohlone Regional Wilderness to the southeast. The Ohlone Trail is a fine one, covering almost 30mi between Del Valle and Fremont, but for whatever reason a permit is required even for day hikes. I followed the Ohlone Trail from Del Valle for about 3/4mi until I spied a use trail heading more directly up towards Rocky Ridge and on a whim decided to follow it. Unsigned, the trail proved a good one, traveling through oak understory and cleaving a path through the chaparral-covered upper portion. The trail travels outside the park boundary (two fence crossings required) for a short while before re-entering the park atop Rocky Ridge. The hike along Rocky Ridge heading southeast is very nice with good views and modest elevation gain/loss. I reconnected with the Ohlone Trail along here, but left it again where it drops down to Williams Gulch. Instead, I followed lesser-used roads continuing SE along Rocky Ridge, leaving the park boundary again for a 1.4mi stretch before re-entering once more further up. This part of the park is not described on the park map since it has no trail access to reach it without going through private property. The last 1.2mi to Lookout Point is also outside the park boundary. On this stretch I went by an unoccupied corral that appears to get some usage during the year, along with an old homestead that has been abandoned and in an advanced stage of disrepair. 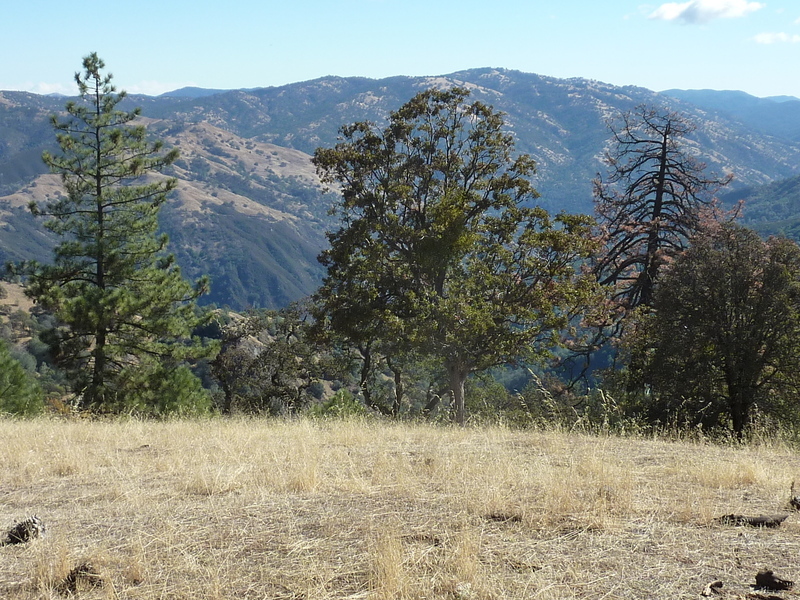 The highpoint of Lookout Point does not have any views to speak of but another quarter mile further on provides a slightly lower point with a fine view overlooking the Arroyo Valle and Trout Creek drainages to the southeast and south.